It goes without saying that to succeed immensely in blackjack, a gambler should be aware of the strategies, tips and the odds in this game. Actually, it is essential to know how to use blackjack odds in your favor. In other words, odds are the keys to winnings. It should be noted that if you implement basic strategy correctly in your game, you can decrease the house edge to 0.45%. So, it means that you are likely to lose 45 cents out of $100. On the other hand, if you do not use basic blackjack strategy in a proper way, the house edge can increase. It can even rise up to 5%. Moreover, you should avoid insurance move. In fact, it can lead to 7% house edge. So, as you can understand it is useless and tricky move. It should be mentioned that different modifications of the game have different odds. So, you should take it into consideration before starting to play blackjack. 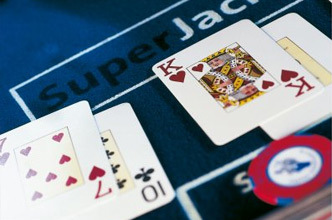 Some online casinos stick to the rule, which enables the dealer to hit soft 17. In its turn this change results in 0.66% house edge. So, pay attention to this factor as well while choosing online casino to play. Besides, if you make a proper use of surrender move, which allows you to save the half of your original wager, you can decrease the house edge as well. Indeed, the correct implementation of this move can make the house edge go down to 0.35% - 0.55% depending on the rules online casino sticks to. Furthermore, as you know, an ordinary payout for winning with a blackjack is 3:2 ($150 on a bet of $100). There are some casinos, where blackjack payout is 6:5 ($120 on a bet of $100). Be aware of this and avoid playing at online casinos offering such payout. There are some online casinos, which do not let gamblers to double down after splitting. Indeed, it is not favorable rule for players. Besides, you should pay attention to the decks, which are used for playing blackjack. If a casino utilizes the so-called Spanish decks, it means that your odds are lower than usual.